Insomnia is a simple WPF application that calls the SetThreadExecutionState API to disable sleep mode for as long as it's running. (Note that the display can still power off during this time - it's just sleep for the computer that's blocked.) Closing the Insomnia window immediately restores whatever sleep mode was in effect before it was run. It couldn't be easier! Insomnia basically boils down to a single function call - but to a function that's a Win32 API and is not part of the .NET Framework. This is where a very powerful feature saves the day: Platform Invoke. For those who aren't familiar with it, P/Invoke (as it's called) lets a managed application call into the APIs exposed by a native DLL. All it takes is a dash of the DllImport attribute and a little bit of translation from the Win32 types to their managed counterparts. The MSDN documentation goes into lots of detail here, and I encourage interested parties to go there. 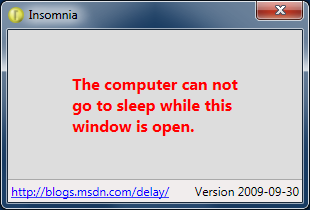 The Insomnia window has its Topmost property set to True so it's always visible and people will be less likely to accidentally leave their computers sleep-less. Other than taking up a small bit of screen space and memory, Insomnia consumes no system resources, so it won't get in the way of whatever else is running. It is considered polite to leave things the way you found them, so Insomnia makes an extra call to SetThreadExecutionState when it's closed in order to restore things to how they were. However, this is really more for show than anything else, because the execution state is clearly per-thread and Insomnia's thread is about to die anyway.